The Lexus GS is a mid-size four-door luxury sedan. 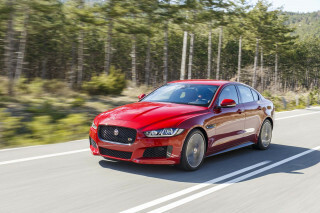 It takes on luxury stalwarts such as the Jaguar XF, Cadillac CTS, Mercedes-Benz E-Class, and BMW 5-Series. Compared to the Lexus ES, which was new for 2019, the GS is a little more raw, with rear-wheel-drive bias, and a high-performance variant. 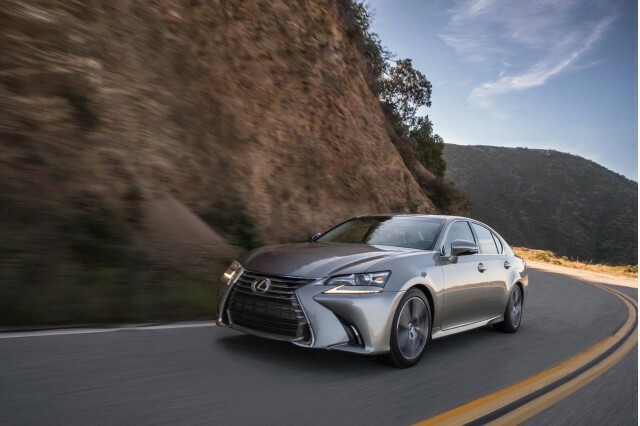 The GS four-doors span the spectrum of powertrain offerings: the family includes the GS 300, with its turbo-4; the GS 350 with a V-6, and a performance-oriented F Sport edition for every model, as well as the high-performance GS F. A hybrid-powered GS 450h was dropped for the 2019 model year. Lexus skipped the 2012 model year with its mid-size sedan and hybrid, introducing a new GS for the 2013 model year. With a 306-horsepower, 3.5-liter V-6 (now up to 311 hp), paddle-shifted 6-speed automatic, and a decidedly sportier setup than before—along with an updated wood- and leather-trimmed cabin—the GS 350 hit all the marks for performance and features in a high-end sport sedan. 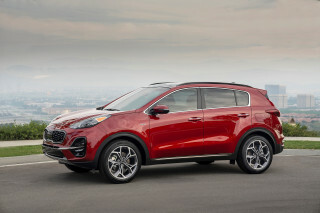 A huge 12.3-inch widescreen system sat front and center, with split-screen views for the navigation system, or connectivity to apps such as Pandora or Facebook. Lexus also brought back the GS 450h hybrid in 2013, but initially chose not to build another V-8-powered GS. For 2015, Lexus upgraded the GS's infotainment setup to include an app suite. It included updates to iHeartRadio and the addition of streaming from the Slacker app. Cars with navigation get the same system that was fitted to the IS, which has improved map views, predictive traffic routing, voice recognition, and the ability to pause and rewind live radio within a 15-minute window. A touchpad controller replaced the previous mouselike infotainment interface piece, which was not well-liked. A GS 350 F Sport added 19-inch wheels, bigger brakes, and subtle styling tweaks. Lexus added an F Sport version of the GS 450h hybrid for the 2015 model year as well. Lexus introduced the first GS F at the 2015 Detroit auto show. Marking the return of a V-8 to the GS lineup, the GS F challenged the extra-powerful sedan offerings from Mercedes-AMG, BMW M, and Audi Sport, though with less power. Similar to the smaller RC F coupe, the Lexus GS F combines a high-powered engine with chassis tweaks and a more aggressive appearance, producing a sportier version of Lexus's sportiest mid-size sedan yet. For the 2016 model year, Lexus added a new 2.0-liter turbo-4. It puts out 241 hp and can accelerate the sedan to 60 mph in 7.2 seconds. The 2017 changes mostly revolved around additional equipment. The Lexus Safety System+ became standard. 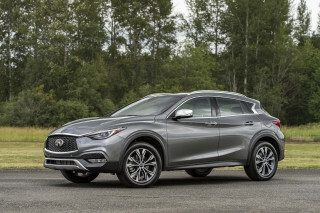 It included forward-collision warnings with automatic emergency braking and pedestrian detection, adaptive cruise control, intelligent high beam headlights, and active lane control. Also new were a standard navigation system on the base model and a limited-slip differential for models with the F Sport package. Changes for 2018 were minor. The GS 200t changed its name to GS 300 and the Lexus Enform Safety Connect and Service Connect were included for 10 years. Safety Connect is a telematics service that offers emergency services and Service Connect alerts owners when maintenance is due. The Lexus GS first bowed in 1993 with an evocative shape penned by the Italian design firm Giugiaro. Dubbed the Aristo in Japan, the first GS sedan had an independent suspension, an in-line 6-cylinder engine with normal aspiration or a twin-turbo version shared with the Toyota Supra (in Japan only), and an option for a V-8. The sleek sedan was paired with the new SC300 and SC400 coupes, and brought Lexus accolades for expressive design and performance. A Nakamichi sound system and walnut trim were among the high-dollar features installed in the GS. In its second generation, the 1998-2005 Lexus GS added more performance options to its portfolio. Along with its 6-cylinder and V-8 engines, it added four-wheel steering and a manual-shift mode for its automatic transmission, but all-wheel drive was not offered. Notable design features included egg-shaped headlamps that were echoed on the Mercedes-Benz E-Class, and Lexuss' special "Optitron" white-lit gauges. Minor changes were made during this model's tenure, and sales dropped off as Lexus previewed the next-generation GS range in a 2005 concept car. The third-generation Lexus GS went on sale as a 2006 model. It came in V-6 and V-8 versions, with a hybrid variant added as well. The third-generation GS was also the first model to feature Lexus's L-finesse styling upon its introduction. The GS 450h was introduced at the 2005 New York Auto Show. It teamed the 3.5-liter V-6 from the GS 350 with batteries and motors and a continuously variable transmission for what Lexus called a "performance hybrid." While it accelerated strongly, the hybrid version lacked steering feel, carried a price premium, and reduced trunk space—already a shortcoming of the GS. Fuel economy was also a lightning rod for criticism; many test outlets didn't observe any gas-mileage increase with the hybrid. With either the 303-hp, 3.5-liter V-6 in the 2010 Lexus GS 350 or the 342-hp, 4.6-liter V-8 engine in the GS 460, these sedans moved authoritatively. The 6-cylinder was teamed with a 6-speed automatic; the V-8 got an 8-speed automatic shared with the larger LS. The GS 350 was additionally available in an all-wheel-drive version. Performance was strong in this generation, but limited headroom in front and a compromised rear-seat space marred the experience. Refinement was a strong point, and the GS scored well in front-crash tests, though side-impact scores were not as good. Fun to drive. Features glory. Great value. A BMW crusher. Lexus has a winner in this car.